My Sausage & Shrimp Rigatoni features hot sausage and succulent shrimp smothered in a spicy Parmesan cream sauce on top of bed of rigatoni. 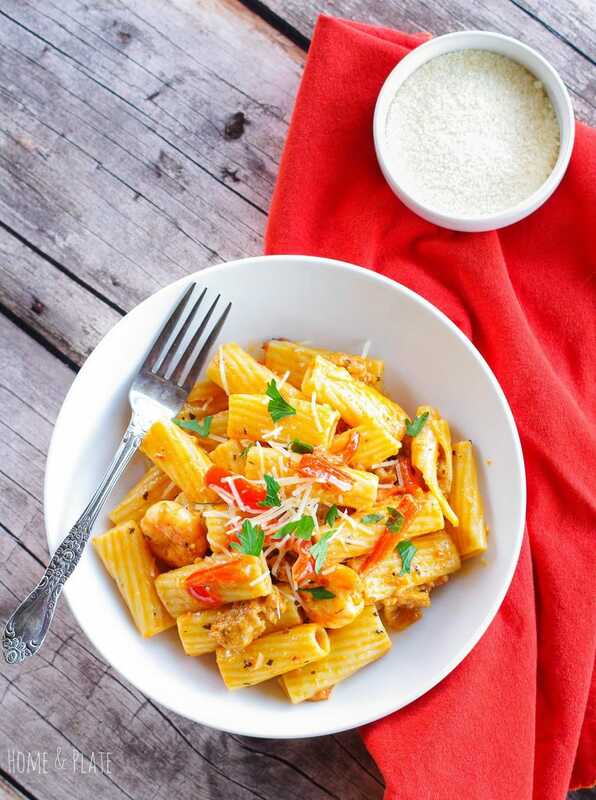 Doesn’t this Sausage & Shrimp Rigatoni just look absolutely delicious? 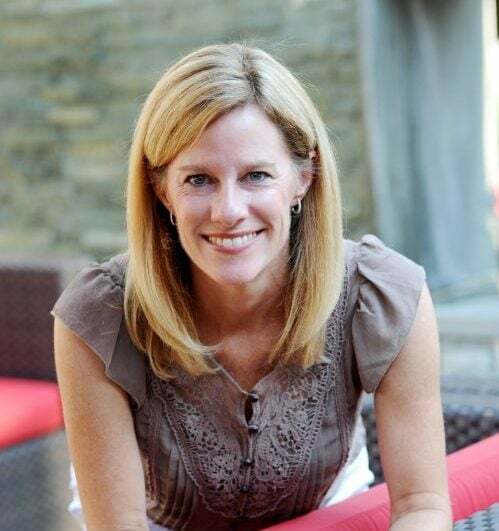 My college girlfriend and I were having dinner together at a restaurant in Dublin Ohio called Tucci’s to catch up. We usually dine Italian where we can get our pasta served with the most creative ingredients. I ordered the sausage and shrimp rigatoni pasta dish in a spicy Parmesan cream sauce and it was fantastic! I love to try to re-create recipes I’ve enjoyed dining out. Pasta is easy to work with because it goes with so many different ingredients. It’s hard to mess up. And most pasta recipes are kid friendly. This recipe was easy to replicate. 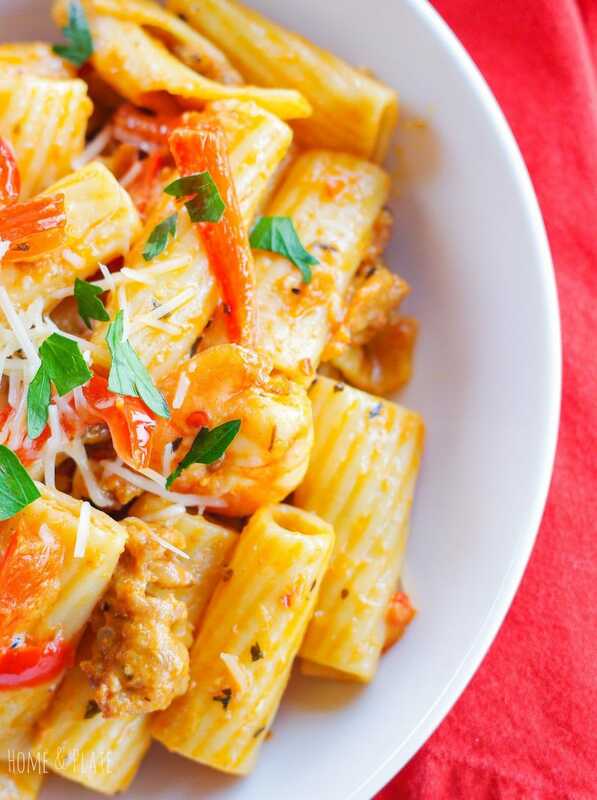 Rigatoni. This type of pasta allows the sauce to coat evenly. Sausage. Hot sausage gives the right amount of heat to this recipe. You’ll need at least 2 links. Shrimp. You’ll need about a half a cup of fresh shrimp, peeled and deveined. Sweet bell pepper. Red, orange or yellow adds a hint of color and adds sweetness to this dish. Onion. Sweet Vidalia onion is my go-to onion for just about any recipe that calls for it. Garlic. Fresh or jarred minced garlic is what you’ll need, about 2 teaspoons. Cream. One cup of heavy cream. Parmesan cheese. Splurge and pick up a container of fresh grated or shredded Parmesan cheese from your deli department. Marinara. I like to stick with a tomato and basil jarred marinara, like Classico brand. Herbs. You should already have dried basil, red pepper flakes, black pepper and cayenne pepper in your pantry. If not grab what you need. Butter. At least a stick. 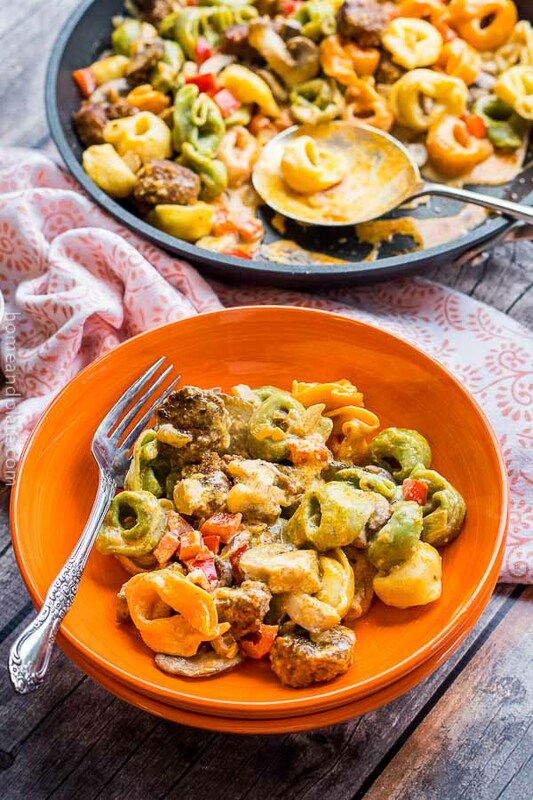 Spicy bits of ground hot sausage and sweet shrimp get dunked in a spicy Parmesan cream sauce for a real Italian treat. 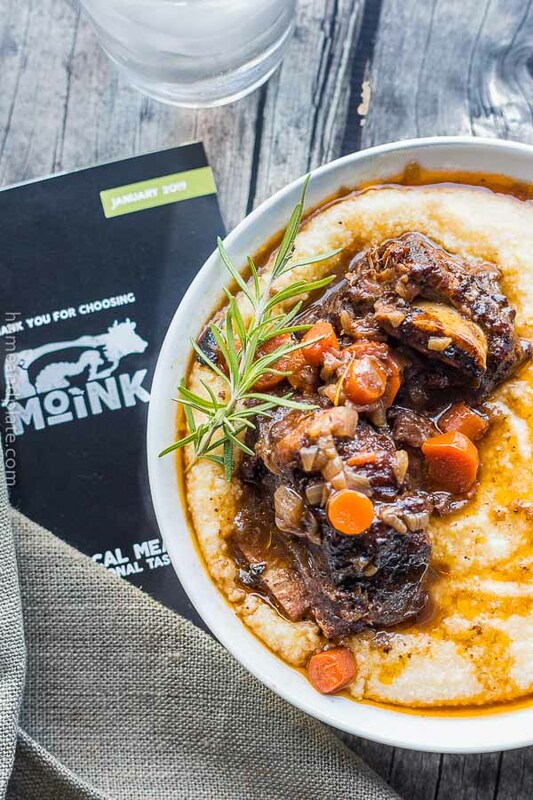 Less than 30 minutes from pantry to table, this recipe it’s perfect for a mid week family meal or dinner for two. 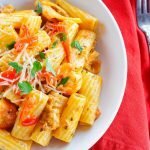 Rigatoni holds creamy sauces extremely well. 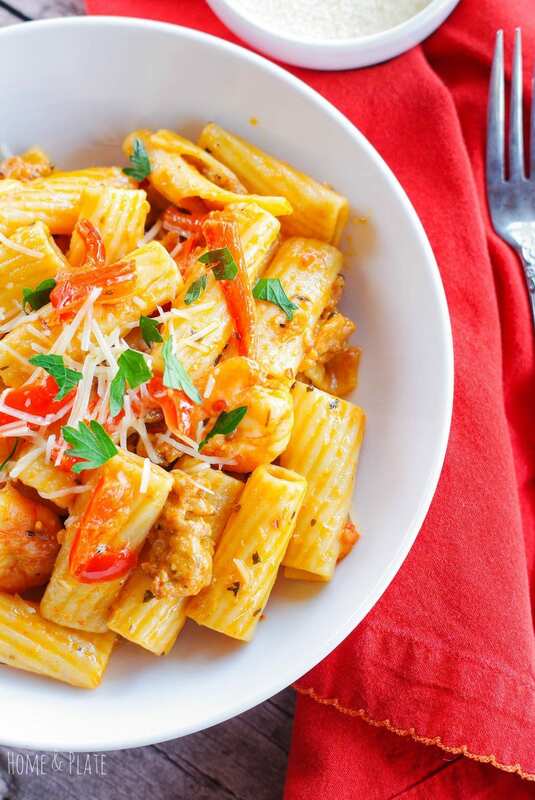 Penne pasta would also work well with this recipe. Sweet red bell peppers add color and contrast perfectly with the bite from the sauce. This Parmesan cream sauce is the perfect balance between cream and tomatoes. I used marinara because I had an open jar in my fridge. But canned crushed or diced tomatoes would work just as well. If sausage is not your thing be sure to try my Chicken & Wild Mushroom Fettuccine Alfredo or Angel Hair Pasta with Pancetta, Pine Nuts and Chicken. Prefer a meaty red sauce? Then look no further than my Meat Lover’s Tomato Sauce. If you love pasta as much as I do be sure to follow me on Pinterest for all my latest recipes. Prepare the rigatoni pasta according to the box directions. Drain and set aside.In a large skillet heat the olive oil and add the onion. Sauté at medium high heat for three minutes. Add the sausage and brown, about five minutes. Add the garlic and red bell pepper and sauté 3 minutes until the bell pepper has softened.In a separate small pot stir the cream, butter, Parmesan cheese, marinara, and spices over medium heat and allow to simmer and bubble. Add the shrimp to the skillet and cook for 3 minutes until pink. Stir in the cream sauce and pasta and allow to simmer for a few minutes. Serve with a sprinkle of Parmesan cheese. You had me at the word spicy. My husband would love this, and I could easily make a veggie variation for me too. This recipe would be delicious vegetarian. Just the addition of lots of veggies would be phenomenal. Thanks so much. With the blend of flavors, this has got to be good. It is so fun re-creating restaurant recipes at home. I agree. Sometimes the best recipes are ones that come from a little inspiration. Thanks Christine. 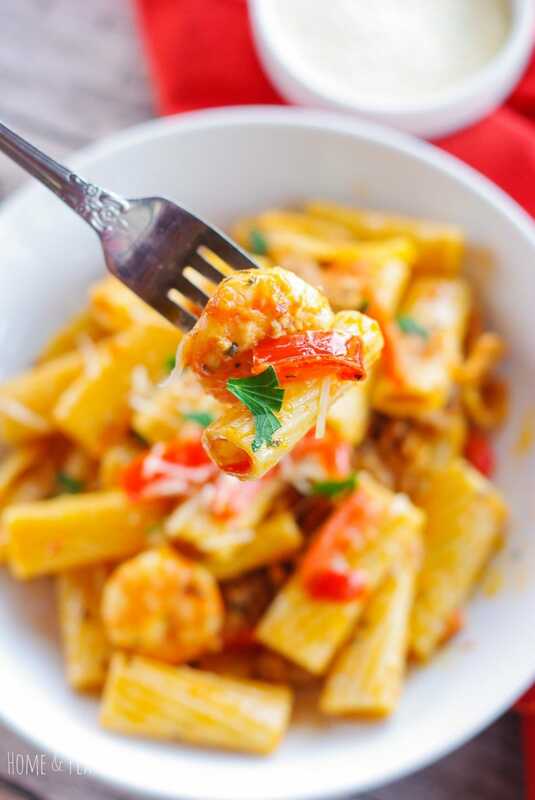 Ah that pasta looks so good, I swear I started salivating the second the page loaded! If you lived next-door I’d bring you a bowl. Thanks for the love. This was sooo good – definitely restaurant quality. I’ve often wondered how to duplicate the cream sauces that I’ve had while dining out and now I know. I doubled most ingredients since I used a whole box of pasta (did not double the heavy cream or butter) and it came out great. Thank you for this delicious recipe!